A new layer of color can be just what a home needs to enhance its cosmetic beauty. This new color can be achieved by adding landscape mulch. Not only will this give your home that little pop it needs but will also benefit the life of the plants while protecting your property. 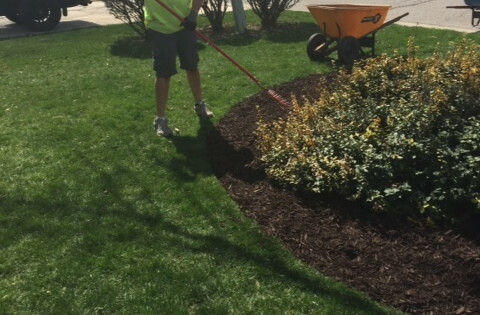 Mulch can be applied at any point throughout the year; however spring is the most common time. Adding it in the spring signifies for many that this is a new year with new life and a new look. Landscape mulch is easy to install and typically needs to be redone every year or two. If the landscape mulch has lost its color or is no longer the correct depth, it is time to consider installing new mulch. Properly installed in landscape areas it is recommended at 3-4 inches deep. When installing new mulch over the top of existing, 1-2 inches may suffice so long as the finished result falls within the 3-4 inch recommendations. From time to time it may be necessary to remove the existing before installing new landscape mulch; however this is rare due to the benefits of leaving the existing. On the market today, there are numerous types. Landscape mulch is available in almost any color requested or texture requested. It is also available from organic or inorganic materials. With so many choices, landscape mulch can meet the needs of any homeowner. Landscape mulch enhances the cosmetic beauty of the yard and of the home. A little bit of new color can make your home the talk of the neighborhood. When installed properly, the mulch acts as a barrier that reduce or even eliminate the number of weeds within the landscape beds. Landscaping mulch acts as insulation for plants that helps conserve water as well as keep plants cooler during the summer months. Over time, old mulch breaks down into the soil. This breakdown will eventually turn into organic matter which is essential to all plant life. Within landscape areas it helps to protect your plants, trees, and property from machine damage, such as mowers and weed eaters. Whether you wish to enhance the beauty of your home, protect the plant life you have invested in, or just wish to protect your home from damage, landscape mulch is a simple solution. The ease of installation and length of time it last, in association with all the benefits that come from it, landscape mulch a economic and efficient choice for almost any homeowner on almost any budget.